My previous phone was a Nokia E61. I liked the E61 as a phone, but found it's web browser to be slow and unreliable and it that, together with the relatively small screen, was beginning to bug me - hence the desire for something else. Naturally I considered an iPhone, but although the company phone plan that I use is AT&T, it isn't possible to use the iPhone on it and I didn't fancy the hassle of sorting out a new phone plan. I tried a Blackberry storm for a few days, but (how about this for irony) the email was no good for me. Blackberries copy every email that comes into the email account, so it doesn't work well for an IMAP account with server-side filters - which is how I use my gmail account. The short statement is that I do like the htc magic android. Physically the device works very well for me. It's small, light, and fits well in my hand. 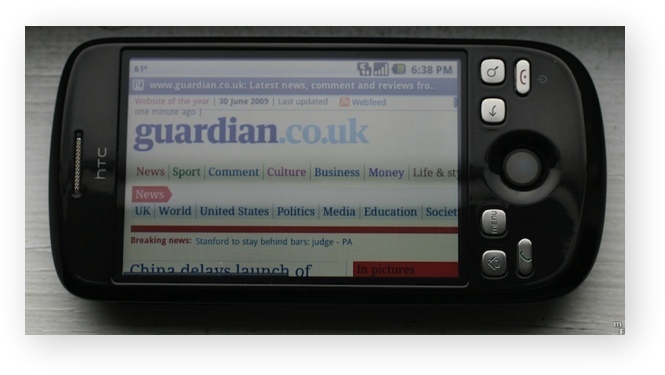 The screen is bright, making web browsing is much nicer than with the Nokia. Battery life seems reasonable, a day or two with my usual usage. The app market seems to have a fair few useful things, I've downloaded a bunch of little apps which have seemed handy. Video play works well. I've watched some TED videos and transcoded some other video using Handbrake which played well on the screen. I like that I can upgrade the memory using a micro-SD card. It came with 2GB, and I'm upgrading to 8GB since it's pretty cheap. I use gmail and Google calendar and the phone syncs nicely with those. The phone charges via a mini-USB connection. One less charger to have to carry around. I read one of the prags's books using an ebook reader and it worked pretty well. My biggest irritant so far is that it makes it hard to browse local HTML pages. It doesn't support file:// URLs. This is a big issue for me as I often copy static HTML files to my phone for reference purposes. There is a work-around, but it's kludgy. Like every other calendar app on the planet, Google calendar suffers from TimeZoneUncertainty. This is a big issue with a phone that you want to change time zone as you travel. I miss the Nokia's keyboard when typing. The soft keyboard just doesn't work as well. While the touch navigation works pretty well, I'm sure I'd prefer the iPhone's multi-touch gestures. I haven't tried writing an app for it. I'd like to experiment, but I'm not allowing myself any such fun until I get the book finished.